The Peoples Democratic Party (PDP) has alleged that Senators were being paid $1million each to support the impeachment of the Senate President, Abubakar Bukola Saraki. It however declared the purported plans by the Senate Minority Leader, Senator Godswill Akpabio, to defect to the ruling All Progressives Congress (APC) from the PDP were unknown to it. The party faulted the Presidency on the late submission of the budget for the 2019 general elections to the National Assembly, just as it tied its funding to constituency projects ‘funds, saying it was one of the ploys by the Executive arm of government to blackmail the National Assembly. 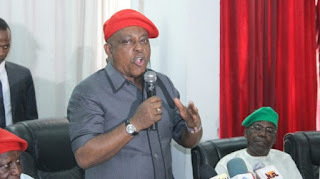 Through its National Publicity Secretary, Mr. Kola Ologbondiyan, the party said on Monday in Abuja that the ruling APC was exploring all unholy means to move for the removal of Saraki. Ologbondiyan told journalists that the country’s constitution was very clear on the steps to be taken before a Senate President can be impeached. He alleged that the antics of President Buhari, who was overwhelmingly elected on the premise that he would fight corruption and implement people-oriented policies, had been busted as his associates have cases of corruption hanging conspicuously on their neck. Ologbondiyan said: “It is no longer news that one Obono-Obla, President Buhari’s Special Assistant on Prosecution and Chairman, Special Investigation Panel for the Recovery of Public Property in Buhari’s anti-corruption team has been indicted for forging his WAEC certificate, yet his boss, Mr. President offered $1 million to each lawmaker to impeach Saraki. “Today, the very leader, who hitherto paraded as pro-poor and saintly, has now been exposed to be at the head of the most corrupt administration that our nation ever had since independence. “The PDP challenges President Buhari to explain why his anti-corruption fight has not been extended to investigate the corruption from the leaked memo detailing alleged underhand oil contracts to the tune of N9 trillion ($25 billion) at the Nigerian National Petroleum Corporation (NNPC) and the Ministry of Petroleum Resources, which are under the direct supervision President Buhari as Minister of Petroleum Resources. “The PDP challenges President Buhari to explain to Nigerians whose interest he is protecting by refusing to allow an independent inquest into the alleged corruption in the handling of the N1.4 trillion oil subsidy regime allegedly involving officials at the Presidency, particularly those benefiting from alleged N58 hidden tax per litre, which Nigerians have continued to bear since the fuel price increased from PDP-subsidised cost of N86 to presumably unsubsidised cost of N145”. He also asked Buhari and the APC to explain whose interests they were protecting by suppressing investigation into the alleged use of 18 unregistered companies to lift and divert N1.1 trillion worth of crude oil in 2017. Furthermore, the PDP urged the Presidency and the APC to explain why the anti-corruption fight had not been extended to the internationally reported diversion and alleged stealing of N18 billion of the N48 billion approved by the National Assembly for the rehabilitation of millions of Internally Displaced Persons (IDPs) and rebuilding of six North East states ravaged by insurgency in the 2017 budget. “Can the Buhari Presidency and APC claim to be unaware of the damning report by the United Nations Development Programme (UNDP), a public document, which detailed how officials were using bulk of the resources meant for the IDPs on contracts that were found to have immensely benefitted officials of the APC government, including the sacked Secretary to the Government of the Federation, Babachir Lawal? “Can the Presidency and the APC claim to be unaware of the motion by Senator Baba Kaka Garba from Borno Central, who exposed how persons, known to have connections with the APC, fraudulently cornered N1.2 billion from the Federal Government under the guise of supplying items to the IDPs? “The PDP challenges the Presidency to explain why his ‘famed’ anti-corruption dragnet has not been cast on the National Health Insurance Scheme (NHIS), despite widely reports of alleged stealing of over N25 billion meant for the health needs of the people from the account of the scheme in the Treasury Single Account (TSA) by APC agents” he said. On the attempt by Senators loyal to the President to forcefully open the National Assembly and impeach Saraki despite the fact that the Assembly is on recess as suggested by the Presidential Aide to the Senate, the PDP said that Senator Eta Enang has been Chairman, Senate Committee on Rules and Business in both chambers and should have known the procedures for reconvening better than what he had said. “It is unfortunate that people who have experience in legislative practices and procedure, when they get to the other side, instead of telling the Executive the limits of their powers, they pretend to know it all and by so doing, they mislead the executive,” he said.